The Baker Tilly Europe Alliance Meeting 2018 got more than100 business partners from different countries connected in the melting pot of Berlin. Ted Verkade, CEO & President of Baker Tilly International, and Alan Whitman, CEO of Baker Tilly Virchow Krause in the US were among the speakers and participants. 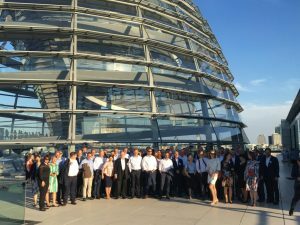 The annual business meeting of the Baker Tilly Europe Alliance, a collaboration between the TPA Group in CEE and Baker Tilly Germany, was held from 6 – 8 July in Berlin. The motto of the networking and business developing event was ‘Get Connected’. The international participants (from all over Europe and even from the US) exchanged their business ideas and got to know each other. Baker Tilly in Germany provided an excellent supporting program: The kick off for the event was an exclusive rooftop dinner on the famous Reichstag building. On Friday after the offical part of the event everybody joined on a boat trip on the Wannsee, which was followed by an excellent dinner at the Wannseeterrassen with a stunning view to the lake. Since there was important game of the FIFA World Cup 2018 happening that night, soccer fans among the attendees had the possibility to watch the match after dinner. The meeting officially ended Saturday morning with guided tours to Berlin’s most famous hotspots and must sees.